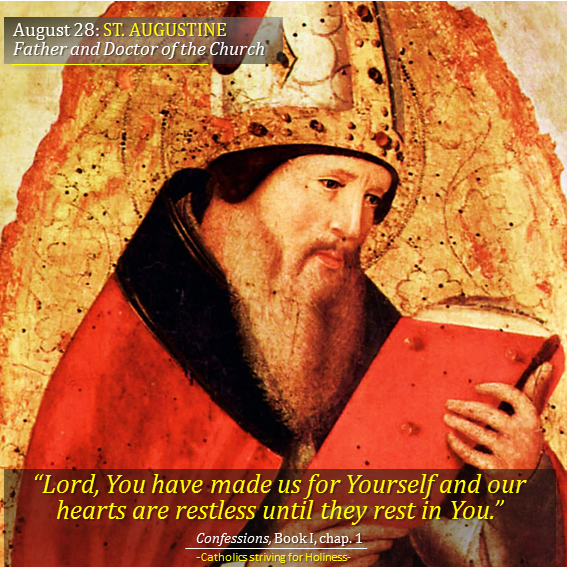 The life of St. Augustine of Hippo, Father and Doctor of the Church, son of St. Monica, is a great example of God’s love, mercy and patience, always disposed to wait for man to return to Him through humility and contrition, paving then the path of conversion and holiness. Prior to his conversion, St. Augustine led a dissolute and loose way of living, living with a mistress for several years, engulfed in a worldly life, ebriated with bodily pleasures, fame, ambition, pride and vainglory. But with God’s grace and St. Augustine’s correspondence, he made a complete turnaround and became a great philosopher, theologian, priest, then Bishop, defender of the orthodoxy of the Catholic faith, all these, thanks to the fervent and persevering prayers of his mother, St. Monica, and the help and friendship of St. Ambrose of Milan. Let us ask St. Augustine’s intercession so that we may also heed God’s numerous calls towards conversion throughout the day. Let us never forget to pray as well for the conversion of many souls everyday. Today is a special day to pray and thank as well the Augustinian friars for all the work they have done for God’s glory and for the good of many souls.